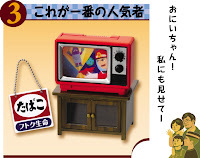 Re-ment 2006: #3 of "Nostalgic Home Appliances"
Appliance miniatures made by Glico. Modern Japan, a country synonymous with technology and gadgets, living without electrical appliances would be abnormal or at least inconvenient. Back in the Taisho period or the 1950s, however, having any kind of appliance in the house was seen as a luxury. Newly weds, especially housewives would dream of owning 'Shu no Jingi or 三種の神器' products. Literally meaning the three imperial regalia, the products that came under this term exuded modernity and comfort. The fifties embraced the refrigerator, the washing machine and the TV. In the seventies, they were the three C's; the color TV, the cooler and the car. Nowadays, not three but maybe a plethora of electrical goodies like the mobile phone complete with the internet, mp3, road navigation, TV and radio.....the list goes on forever!